Sun., Sept. 16, 2018, 6 a.m.
A 109-room, $10 million hotel will be built near the Spokane International Airport, according to city permit records. 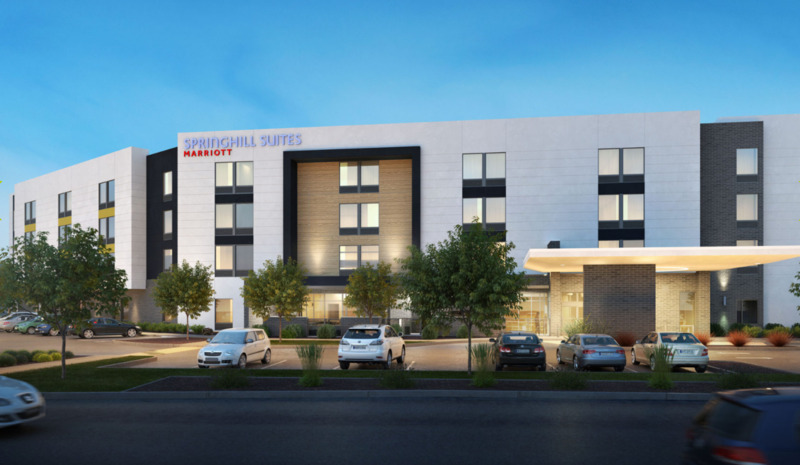 Springhill Suites, as it will be called, will have an indoor swimming pool, outdoor patio, parking lot and a “porte cochere,” or carriage house. The four-story building will be about 68,000 square feet. Tharaldson Hospitality Management, based in Decatur, Illinois, will build the Marriott International Inc. hotel on a 2.6-acre site near the airport terminals, just north of the two parking garages between the exit plaza and outbound Airport Drive. The hotel’s construction is just the latest work to be done at the rapidly expanding airport. Direct flights between cities such as Denver and Las Vegas have been added in recent months. A new, 1,300-stall parking lot is under construction. The airport’s two terminals will see a $130 million to $160 million renovation and expansion beginning next year. Tharaldson Hospitality plans to lease the land from the airport for 30 years, with one 20-year renewal option. Led by businessman Gary Tharaldson, the hospitality management company owns and operates more than 30 hotels in 14 states, with several properties scheduled to open this year. The project’s owner is listed on city documents as Don Cape, the Las Vegas-based director of development for Tharaldson Hospitality Management. The development was designed by DesignCell Architecture, also of Las Vegas. A project between Lutheran Community Services Northwest and the Community Health Association of Spokane will bring a geriatric center to North Monroe Street. About $370,000 in improvements are being done at the old Christ Clinic, which was closed after Lutheran Community Services took over responsibility for the clinic in July 2017. The work will renovate the existing 4,750-square-foot space at 914 W. Carlisle Ave. and build a new pharmacy area. According to city permit records, the clinic will be called the CHAS Monroe Street Geriatric Center. It is owned by Lutheran Community Services Northwest. The building is also occupied by the Christ Kitchen, which remains open. The project’s architect is Bernardo|Wills Architects, of Spokane. The Great PNW, a local apparel company, has been issued building permits for a new warehouse and office building in Spokane’s East Central neighborhood, according to city permit records. When the company moves from its North Monroe Street location to the new building at 519 N. Sycamore St., it will be the third move for the fast-growing company. It will also quadruple its space, a sign of its continued success selling Northwest-themed hats, T-shirts and other items. The company purchased two properties in December 2017 for $160,000. Construction of the 5,800-square-foot, two-story warehouse and office building is valued at nearly $350,000, according to city documents. Joel Barbour, the company’s founder and owner, started the business in 2013 out of his backyard. In 2016, the company moved to its current location on North Monroe, a warehouse near Grace Avenue with about 2,000 square feet of space. But the rapid growth of its online sales at TheGreatPNW.com, led the company to need more space. Goods from the company are also sold at 40 retailers in Washington, Idaho, Oregon and Montana, and can be found locally at Atticus Coffee & Gifts and Kingsley & Scout. The contractor for the warehouse is Van Doren Construction, of Spokane. It was designed by Paul Harrington, of Spokane Valley’s South Henry Studios. Published: Sept. 16, 2018, 6 a.m.